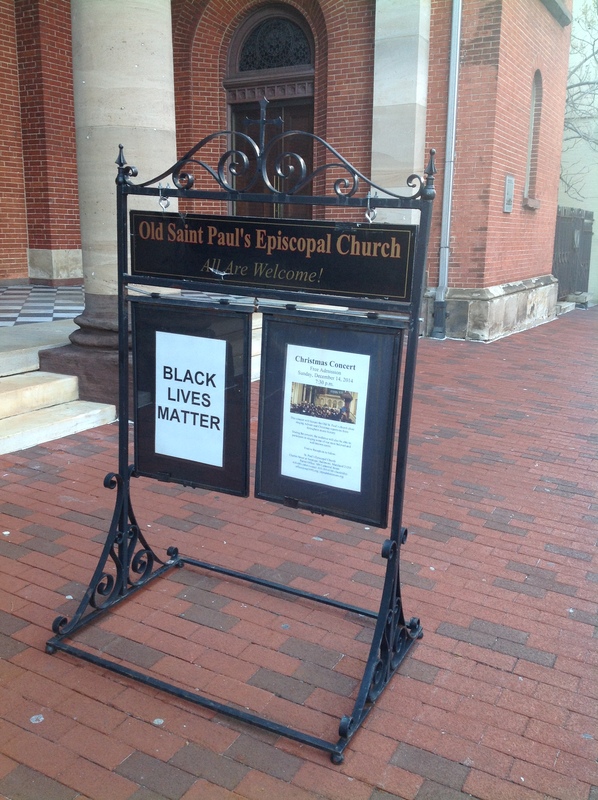 For several weeks this winter, our Old St. Paul’s front sign read: Black Lives Matter. In our Sunday forums, we often discuss not only issues of equality in relation to race, but also to gender and sexual orientation as well. (In fact, one of the first forums I attended at Old St. Paul’s was on feminism and the Church, led by Youth Minister Jessica Sexton.) Right now, our vestry is working to get a new ramp installed to enhance ease of accessibility to the church building, showcasing our commitment to also reach out to people regardless of ability or disability. What’s more, Old St. Paul’s continues to actively look for new ways to strengthen and reach out to the fullness of its community, both in and outside of the Church (hence, the number of forums now dedicated to addressing social justice issues). As a feminist, as someone who spent part of her childhood as a P.K. (a preacher’s kid), who has family members of different races and sexual orientations, who’s lived through a parents’ divorce, who acknowledges evolution and climate change, and who’s had close family members suffer everything from severe illness to death to imprisonment, I have experienced some of the best and worst of church communities. Old St. Paul’s, however, has proven to be nothing but supportive, open-minded, and welcoming—a place dedicated to not only being a true and constructive member of its colorful community, but to encouraging this kind of belonging and community within others. As a Christian, I have learned that, if you want to consider yourself as belonging to a community or family—whether it’s as an American, Christian, sister, friend, etc.—then you can’t simply come to the parties and celebrate the community’s accomplishments. You have to be there to help shoulder the burdens, pains, and debts of your community as well. At Old St. Paul’s, I’ve been blessed to see just this kind of belonging and community exemplified week after week in both its clergy and laypeople. My husband and I have attended Old St. Paul’s for just over a year, and we’ve now decided to be officially confirmed this upcoming March. As my confirmation date approaches, I find myself filled with joy, gratefulness, and a renewed sense of belonging. I believe I have found a place where I know I’ll have friends when I need them, and where I will always be honored and glad to extend my hand when called upon. By livingourfaithosp in Community, Social Justice on February 8, 2015 . I read this earlier and very much enjoyed it but something was grating on me, and I realize now what it is. I agree that to feel as though you are fully part of a community it is nice to help with the nitty gritty, but in church, especially, I think we need to be careful about what that looks like. Not everyone is physically, psychologically or financially able to provide a contribution, and for some, just showing up is all they can give. Church is at its core a home for broken people, and some are more broken than others. I think that is why most decent churches feel a call to welcome people as they are – and should. Not everyone is ready to sign up to volunteer- it’s all they can do to get to church in the morning. There is a meme circulating in cyber space of Eyeore and Pooh, reminding us that Eyeore was always welcome at the party even though he never really contributed, he just was. We need to remember that the Eyeores among us are the ones whom God seeks out, and for the rest of us the blessing is in enjoying their company. Dear Lynda, I — Katie — fully agree with you! I suppose my post was more aimed at readers who were already in a strong, safe place in their church community, intending to encourage them to reach out to precisely those people you mention — those most in need of help/support/encouragement. When I said, “You have to be there to help shoulder the burdens, pains, and debts of your community,” I definitely was thinking of those burdens, pains, and debts within your own church community as well, and not just those in your larger community. This means making a special effort to reach out to those who can’t or are not yet ready to reach out themselves. Katie – I am so glad you and Evan have found a home here in this parish. We have been working hard as a congregation to be truly welcoming to all kinds of people in all kinds of circumstances. At times we do this imperfectly, but when we get it right I think it is living into the Kingdom of God that Jesus wants us to help build.